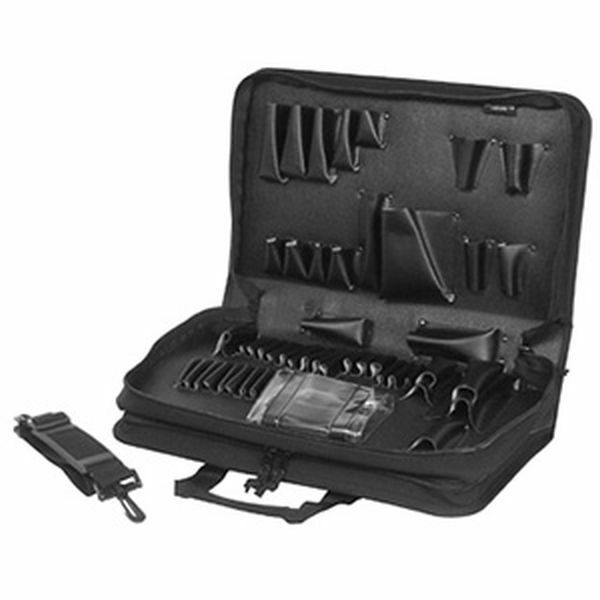 This case represents a new concept in design by combining the sleek style of a professional carrying case with the sturdiness of a quality tool case. 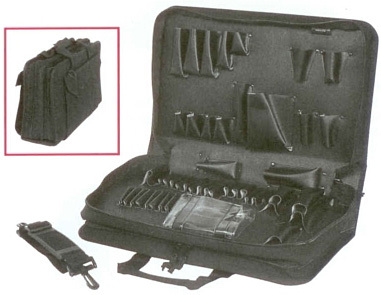 One compartment of the case is devoted to the storage of tools, having 48 pockets of various sizes, while the other compartment is designed as a briefcase for storing manuals, files, billing pads etc. Also included is space for a clipboard, writing instruments and even a calculator. Measuring 18-1/2: L x 11" H x 5-1/2" D, this case is made of a lightweight, yet durable, Cordura nylon. The outside of the case has one side with two separate pockets (10" x 6"), while the other side has one larger pocket measuring 10" x 12". Comes in black and weighs 5lbs empty.